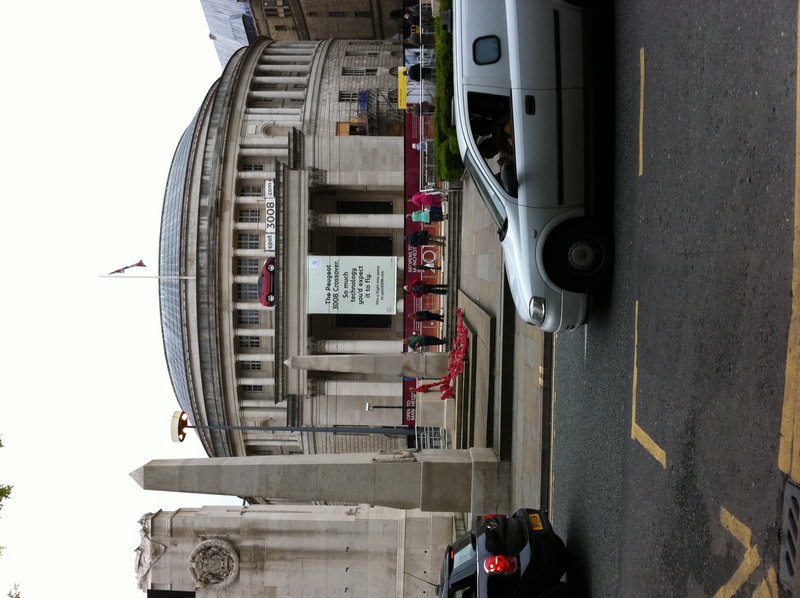 I was in Manchester recently and couldn’t believe it when I saw a Peugeot car parked on top of the library! This is a really prominent location in Manchester with lots of passing traffic and pedestrians, including a tram stop directly opposite. Accompanied by a couple of large banner posters, it became immediately apparent that this was a deliberate marketing campaign. You can see in the picture the people stood opposite the building. You get a lot of people congregating here as it’s a major tram stop. People have got nothing to do but look at the car and see the banner. It’s an ideal location chosen well by the marketing team. The major call-to-action is to visit the website spot3008.com so what do you think people passing by or stood waiting for a tram are going to do? Yep that’s right, they’re going to get their phone out and have a look at the website. What is the point in spending extortionate amounts of budget on marketing to not support the very platforms people will be using to access the call-to-action? What a waste! Hi, that wasn’t our expectation at all. The web address is clearly promoted so I would have expected to simply leave my email address and the location and enter the competition there and then. Thanks a lot for responding Andy. 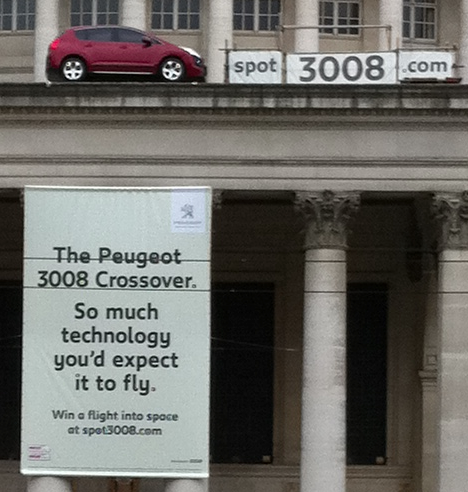 Because it clearly states it’s a competition which is called ‘spot3008’ my expectation was that if you spotted the peugeot 3008 you could enter the competition, which would presumably ask you to enter where you’d seen the car. I had no idea it would be a game and to be honest if i’m on my phone walking down the road I just want a quick way to enter the competition anyway. Perhaps you shouldn’t have worried about needing the game for the mobile version. I think you could’ve gone with a simple form to enter the competition then once the user’s submitted their entry it takes them to the mobile 3008 site. I know they’re not attractive, but I was also expecting there to be a QR code on there. Maybe even a giant one you could scan from across the street.